An obligate or true carnivore is an animal that requires meat in its diet. They may eat other foods offered to them, especially animal products like cheese and bone marrow or sweet sugary substances such as honey and syrup. These foods are not essential and are not consumed on a regular basis. True carnivores lack the metabolism required for the proper digestion of vegetable matter. Some carnivorous mammals eat vegetation specifically as an emetic or substance that causes vomiting. While some cat owners may find the fact that the domestic cat is an obligate carnivore disturbing or objectionable, it is important to bear in mind the practical consequences - cats cannot be vegetarians! Most mammals, including humans and cats, use the protein in food to build and maintain tissue and carry out biological reactions. However, unlike other mammals, cats have evolved in such a way as to be "obliged" to use protein as its primary source of daily calories! By comparison, humans and dogs have evolved to use carbohydrates as our primary energy source. "Their desert origin allows them to conserve water more efficiently." The second evolutionary fact unique to the domestic cat is that its ancestors were of desert origin. Because of this origin, many aspects of a cat's needs are different from other mammals. On a practical basis, because their desert origin allows them to conserve water more efficiently, cats can drink less water per day than a dog of similar size. Fresh drinking water should still always be provided for domestic cats. However, do not be alarmed if your cat seems to drink very little water. Some cats fed moist or canned foods get most of their water directly from the food and their owners rarely see the cat drink! On their own, most domestic cats are "nibblers" and will eat small meals frequently throughout the day and night. 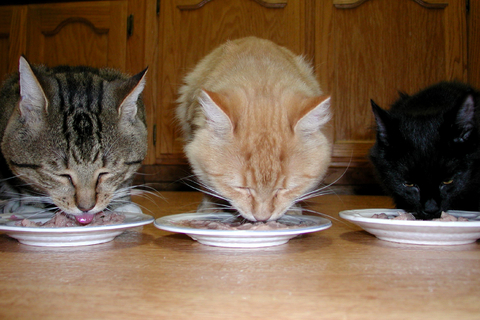 In fact, depending on the individual and the type of food, some cats will eat from 12 - 20 meals a day! This is especially true for cats eating dry foods, whereas moist or canned foods are usually consumed quickly as one to three larger meals per day. "Cats appear to prefer food with a strong odor." As anyone that has ever owned a cat can attest, cats can be "finicky"! This simply reflects the fact that the texture, odor, temperature, and flavor of food are strong influences on a cat's food preferences. Cats often develop preferences for specific textures and/or shapes of food, and some cats will choose the familiar over the novel shape. Cats appear to prefer food with a strong odor. Food temperature influences its odor, and since warm food has more aroma or smell, cats eat it more readily. This is a helpful tactic to use when cats are sick; in many cases, they can be encouraged to eat simply by warming up their food. A good quality kitten food has advantages over adult cat food since it has been specially formulated for a kitten's demanding nutritional requirements. Because of their rapid growth, any nutritional "mistakes" made during kittenhood will have severe, even irreversible, consequences. For most kittens, growth is almost complete by six months of age. They can be changed to "adult" cat food at 8-10 months of age. "Kittens and adult cats do not need milk." It is important to remember that when it comes to diet and feeding behaviors, each cat is an individual with unique needs and characteristics. The number of meals offered and the amount and type of food used will vary with individual preferences and activity levels. 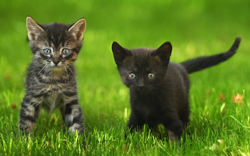 For example, outdoor cats may need more calories than less active indoor cats. In addition, nutritional requirements and dietary preferences change over the course of the cat's lifetime. Kittens, adults and senior cats all have different nutritional needs. Your cat should be fed a diet specially formulated for these life stages. Cats with certain illnesses will benefit from a special therapeutic or "prescription" diet that may control symptoms and delay progression of disease. Choosing a high quality food from the hundreds of available brands can be challenging. The pet nutrition industry is very competitive and relies on persuasive advertising to sell their products. Not all pet foods are created equally, although many commercially available foods are good balanced diets. However, the quality of ingredients can vary, and it can be difficult to determine their quality based strictly on reading the label. Our staff at the veterinary clinic can help you interpret the information, based on scientific principles, and can help you choose a diet that meets your cat's specific needs. When you have questions about a particular food or food ingredient, your best source of help is your professional veterinary health care providers.